John Tiller's Campaign Series is one of those games, another old Talonsoft creation, that even today has a large and faithful following. I've heard about it for years, but was always slightly put off by the look of it. Given that John Tiller designed this game I should have known better. 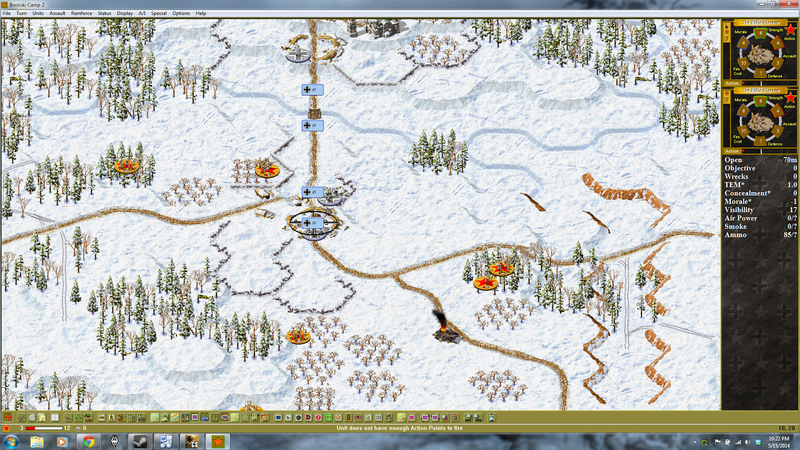 Tiller's new Panzer Battles games are the modern descendant of this famous game engine. I'm very interested in platoon-scale tactical gaming right now. While the single Panzer Battles game that has been released so far is great fun, I wanted a larger selection of scenarios across more theaters of WWII. The Matrix version of the Campaign series contains not only a large number of East Front scenarios, but the West Front and Pacific Front games as well. Through the work of Matrix and a dedicated team of Campaign Series fans (Tiller's involvement ended years ago) this game, originally published in the late 1990's has received a recent update. I'd heard good things and really wanted something that would remind me of playing Panzer Blitz/Panzer Leader years ago. I'm also edging back into board gaming and am seriously considering getting Panzergrenadier by Avalanche Press. Tiller's Campaign Series seemed like it might be worth a try. I've only played a couple of the tutorial scenarios so far, but I'm really enjoying it. Aside from the scenarios there are a bunch of campaigns, including some interesting dynamic campaigns. There's also a random battle generator. If nothing else it should be great for generating scenario ideas for other games like Command Ops and Combat Mission. Tiller's Campaign Series may not have the flashy graphics and animations of a more modern game, and my aging eyes really could use a larger 2D view. Overall though I can see myself sinking a lot of hours into this old gem. And its at a great price point if I remember correctly. Good post to jog my memory about this game. Unrelated, did you see that Flashpoint campaigns is going to release a southern front expansion? Now that would be neat. I picked it up for $30, which isn't bad for 400+ scenarios and campaigns. Yes, it's an older game but there's active development going on with it, so I don't mind the price point. The Flashpoint Campaigns announcement is great news! Matrix also announced a 30 Years War game running on the Battle Academy engine, Looks like AGEOD will also be doing a WWI game, which I'm excited about. AGEOD always makes solid stuff.